Sina Weibo, the microblogging platform commonly know as ‘China’s Twitter’, is taking a leaf from its illustrious US peer’s book after trialling a range of new features for professional media, including a Twitter Cards-like feature that displays article previews in Weibo messages. The move comes as Sina is under pressure to not only make money from its popular service, but also to increase its competitive edge against WeChat, the mobile messaging app from Web giant Tencent with more than 300 million downloads. Despite Sina Weibo passing 400 million registered users, CEO Charles Chao has recently admitted that the length of its average user session is declining due to WeChat’s surge in popularity, and a move to encourage media looks like one strategy that the company is adopting to bolster its presence. Chinese tech blog 36Kr has details of the media initiatives that are being trialled among a number of selected partners. 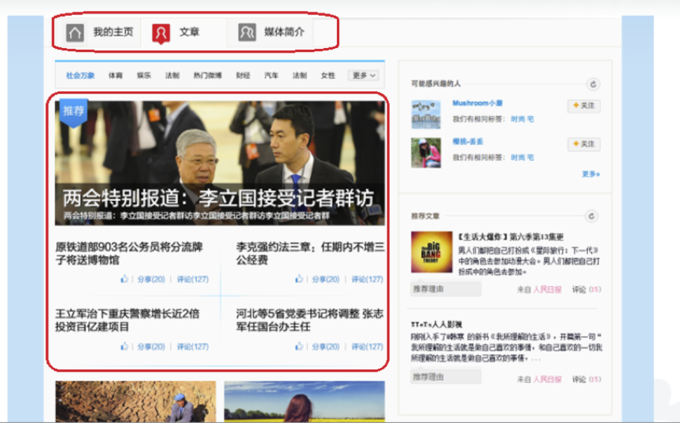 Weibo is adopting a news portal approach to its content, with the front page of the site redesigned to show news stories and details of its media partners. The tabs highlighted at the top of the page include ‘articles’ and ‘media profile’, while the photo box below displays the ‘top pick’ of articles on the site. As this approach suggests, Weibo is giving publishers the opportunity to post full-length articles to their redesigned Weibo account pages, which include templates for the layout and an RSS feed for stories. 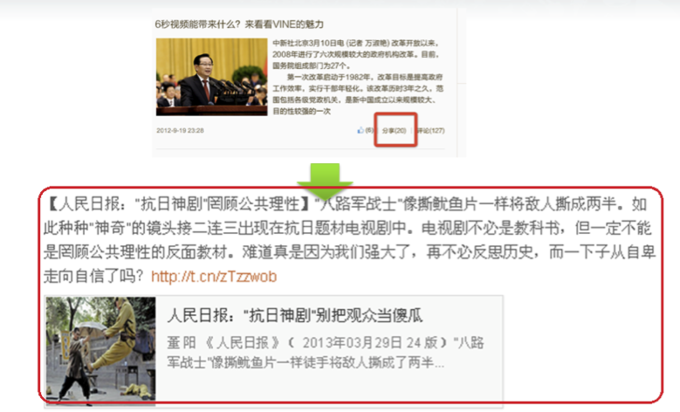 It isn’t clear exactly what the incentive for publishers to post stories to Weibo (rather than their own websites) is at this stage. Each media outlet’s Weibo page will include an about page — ‘media profile’ — but, most interestingly, links to articles will be displayed like Twitter Cards in Weibo feeds, as the image below shows. As is the case with Twitter, selected links bring up a preview photo and article description to entice users to click through and read more. Related to cards, 36Kr suggests that Sina could offer advanced analytics (including breakdown of demographics, etc) to help Weibo partners learn more about which users read their articles. While the initial customer base targeted is media outlets, it is said that Sina could introduce other types of themed Weibo sites to fit other high-end users, including e-commerce sites, government accounts and celebrities. The suggestion being that the accounts would act like central pages to display content in a more attractive and personalized way. Twitter has recently gained plaudits for its efforts to monetize its hugely popular service, and Sina has already made some strides with a number of low-key monetization strategies of its own, including ‘professional’ features, VIP membership, as well as Twitter-like promoted messages that appear in user timelines. Twitter’s advertising revenues are estimated to pass $800 million in 2014, which puts it some way ahead of Weibo. Though Sina doesn’t break out revenue for its microblogging service, it is estimated to have made $22-23 million during its recent third quarter, which is a small portion of the $152.4 million that Sina’s overall Internet content business booked during the three-month period. Twitter recently expanded its Cards initiative to include links to mobile apps, photo galleries and product information in a move that was heralded for bringing new discovery options to the Web, particularly for apps and mobile-based users. At this stage, Sina’s plans appear to be at trial stage, but it would certainly make sense for it to at least introduce cards, if not personalized account pages for some of its more influential content partners.